Barong dance is one of Balinese dances that include in the cultural heritage of pre-Hindu besides Sanghyang dance. Barong word comes from word of "bahruang" means bear, a mythological animal which has magical power and it's considered as the protector. There are many versions about the history of Barong dance. But the meaning are same, about togetherness. 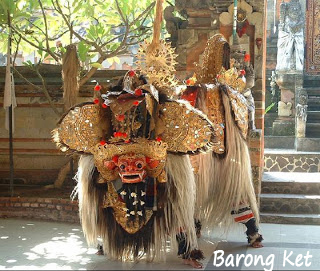 According to Wikipedia, Barong is character in Balinese mythology, whereas in Java called as Barongan. Barong / Barongan is the king of the spirits also Barong symbolize of good. Also Barong is the enemy of Rangda in Balinese mythology. Banas Pati Raja is a spirit that accompany a child in their life. Banas Pati Raja is believed as the spirits that drives the Barong. As the protector spirits, Barong is always displayed as a lion. The traditional dance in Bali that describe the battle between Barong and Rangda is very famous and always be staged as tourist attraction. Barong singa is one of five barong form. In Bali, every part of Bali island has spirits as the protector in every land, forest and everywhere. Every Barong that represent certain region is described as different animal such as tiger, snake, wild boar or dragon. 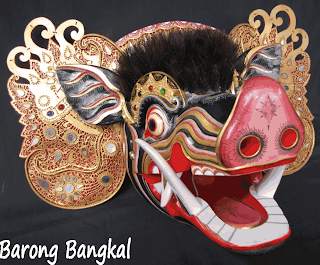 The form of Barong as a lion is very popular and comes from Gianyar. Ubud, located in Gianyar is the famous tourism object. 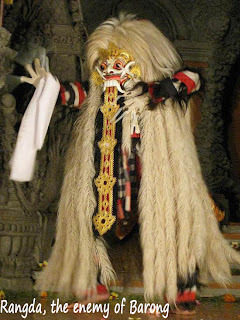 In Calonarang or other balinese dances, Barong use its witchcraft to defeat Rangda, its enemy. Then a strange sound appear from the sky. The sound without appearance is reminding to stop the battle and asking for peace from both sides. At the end both terrible embodiments was merged become one embodiment. Since the time, the community of Using has barong form as the symbol of togetherness. Believed, Barong can cast out evil influence, diseases, and any danger. Up to now, Barong dance and Barong itself is very sacred. Before be danced, Barong must be given a special ritual. If don't, Barong will be more dangerous for the dancer and people over there. Barong dance also don't carelessly to be danced. It's staged especially for village salvation. Mystical value of Barong is always guarded. They who has a chance to be a Barong dancer are only from certain people that can be known naturally. According to Hasnan Singodimayan, a local humanist, the art of Barong Kemiren tells about a beautiful girl named Ja'rifah that is protected by a large animal with bad face named Barong. "Barong is very loyal to its master so it is considered as a symbol of heroism," Hasnan said. The art of Barong Kemiren is similar to Barong art in Bali. The resemblance according to Hasnan is very reasonable because of the cultural proximity that always affect in the relationship history between Bali and Banyuwangi. The different is, physically, the size of Balinese barong is bigger and doesn't has wings. According to Hasnan, there are various versions about the history of Barong Kemiren. Some call that Barong isn't original art of Java, but from Bali. This art is brought and developed by Balinese citizens that is forced to stay in Banyuwangi because of chaos in Bali. Another version tells that Barong art comes from China then it was brought into Java at Majapahit era. 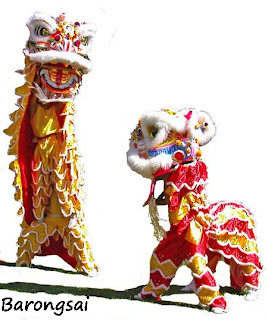 There is similarity between Barong and Chinese lion dance, which develop at Tang Dynasty era from 7th century to 10th century. Barong dance is balinese typical dance that comes from pre-Hindu civilization. The dance describe about the battle between good (Dharma) and evil (Adharma). Form of good is acted by Barong, two dancers by using costume of four-legged animal, whereas the form of evil is acted by Rangda, a sinister and terrible figure with two canines in its mouth. There are several type of Barong dance that is usually staged in Bali island like Barong Ket, Barong Bangkal (pig), Barong Macan (tiger), Barong Landung. However, among three barong dance types, the most frequently staged is Barong Ket or Barong Keket. Costume of Barong Ket generally describe about the blend between lion, tiger, and ox. On its body is decorated with skin ornaments, pieces of mirror glass and also completed with feathers from fibre of pandan leaf. Barong is acted by two dancers (Juru saluk or Juru bapang), one dancer take the front position to move the front legs and head, whereas the second dancer take the rear position to move the back legs and Barong tail. At a glance, Barong ket is not much different from Barongsai that is staged by Chinese community. The difference is located in the story, where the barong dance tells the battle story between Barong and Rangda that is completed with other figures like Kera (Barong friend), Dewi Kunti, Sadewa (son of Dewi Kunti), also the followers of Rangda. Rangda as the mother of Erlangga (The king of Bali in 10th century) was damned by Erlangga's father because she practiced black magic. After become a widow, Rangda called all evil spirits and devils in jungle then she came to Erlangga, her son. The battle happens, but Rangda and her army wass too strong and Erlangga have to asked Barong help. Barong came and the battle happens again. Rangda magic made all Erlangga army want to suicide. They stabbed their body and chest with poisonous kris. Barong succeed to protect Erlangga army so they're immune from sharp kris. At the end, Barong won, and Rangda ran away. Barong mask and Rangda mask are sacred masks, and before they bring it out, pemangku (the leader of Hindu ceremony) attend to sprinkle them with holy water, which is takken from Mount Agung, and moreover, several offerings also be presented. In its development, Barong in Bali is not only manifested in the form of four-legged animal but also in the form of two-legged animal. Barong types in Bali is devided into several forms as noted above. A. Barong ket (ketet). You can see this one in many places in Bali and it's the most frequently staged also has complete dance movement. Barong ketet is the blend between tiger, lion, and ox. The body of Barong is decorated by skin ornaments, pieces of mirror glass, and its feathers made from pandan fibers, or crow feathers. To use it in every religious ceremony or some shows, it needs two dancers that is called as Juru saluk or Juru bapang. These figures generally describe about the battle between good and evil where this theme always almost become the basic on every art attractions in Bali. Gambelan (traditional music instrument) that is used to accompany the dance is Gambelan bebarongan which use pelog as its barrel. In some place, the dance is accompanied by Gambelan semar pegulingan. B. Barong Bangkal. Barong Bangkal means old big pig where Barong Bangkal looks like an ordinary bangkal (pig) or usually called as Barong celeng or Barong bangkung. Barong Bangkung usually use Gambelan batel as music instrument where, in religious ceremony or some shows, it's very seldom to use figure and Barong bangkal is usually staged from one place to another place or sometimes it's only staged to get around the village. C. Barong Asu. Barong Asu resembles a dog especially at its mask and it's very sacred. Located in Pura Puncak Dawa Baturiti, Tabanan regency. D. Barong Gajah. Barong Gajah resembles an elephant, very sacred and one of them is located in Singapadu village. E. Barong Macan. Barong Macan resembles a tiger where in every shows, it's danced by two dancer. Sometimes accompanied by dance drama like Arja and Barong Macan usually use gambelan batel as their music instruments. F. Barong Landung. Barong Landung is different with another Barong that has been mentioned above. The form of Barong landung resembles an ancient human with two legs. 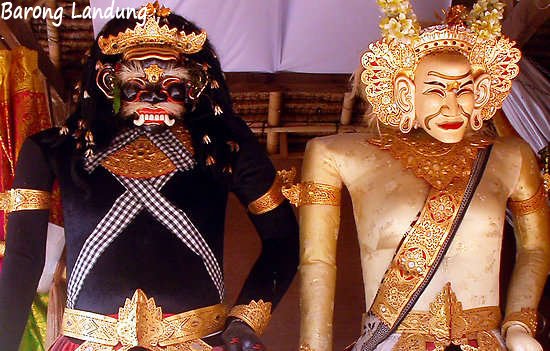 Generally, Barong landung is made in pairs, consist of Ratu Lanang (Barong landung in male form) and Ratu Luh (Barong landung in female form). The form is high and large (like ondel-ondel in Jakarta). Face of Ratu Lanang is very terrible. The face is black and its teeth is out whereas face of Ratu Luh looks like old chinese woman. In some place in Bali, Barong Landung is also equipped with other types of Barong landung such as Mantri, Baluh, Limbur, and many more. In some shows, Barong landung take some figure like Arja figure (especially in Badung, one of regency in Bali) and accompanied by gambelan batel. Moreover, there are another type of Barong generally like Barong brutuk located in Trunyan village (a small village located in the east side of Lake Batur). Barong brutuk use feathers made from banana leaf, which has been dried named 'kraras' and it's highly purified by Trunyan community over there. This post give truly quality information. I am definitely going to look into it. Really very useful tips are provided here. Thank you so much for sharing !